We visit local schools, retirement homes, service groups and convalescence centers. We visit veterans to help where we can and to provide information. We also serve as guest speakers. One of these opportunities led us to the Carrboro Charles House for an Memorial Day observance. Peter O’Grady made a presentation on the history of the holiday, how it is commemorated locally and at our Post. In this picture, we are at the Charles House with their veterans. 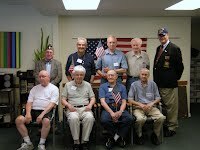 Peter O’Grady was joined by the Veterans of Foreign Wars Chapel Hill Post commander.